Our worship theme for February picks up on our year-long examination of prayer. We spent October exploring prayer as the journey inward. In February, we will reflect on prayer as the journey upward to God. In May we will conclude with prayer as a journey outward. 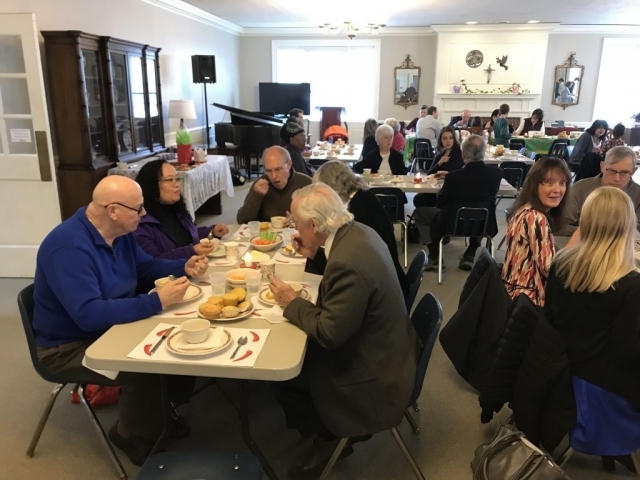 These themes grow out of the RenewalWorks process we began a year ago and are part of our work to equip people to go deeper in their spiritual journeys, and to bring energy to our spiritual vitality as a congregation. We encourage each member to cultivate spiritual practices that nurture your soul as you reach out to serve others in Christ’s name. 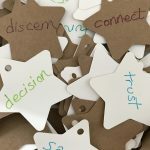 On Epiphany (January 6) we handed out Star Words during worship. These paper stars each have one word written on them. They are meant to be a gift to you for the coming year. You choose a star, not knowing what word it holds for you. Then you spend the year meditating on the meaning of that word for you, and seeking ways to live more deeply into that word. If you do not have one, the basket of star words will remain in the Campbell Room until Lent. You may keep your word confidential, or share the word you received. So – how are you doing with your word? What was your first thought when you received it? How do you think about it now? In what ways have you been able to receive your word as a gift? Please share your journey of living into the gift of your word by joining the discussion here. 2/10 – Jesus, Judaism, and Justice – Weaving together scholarly insight and personal story, noted Jewish New Testament scholar Amy-Jill Levine examines Jesus’ claim to be “the way, the truth, and the life” (John 14:6) from an interfaith perspective. 2/17 – A Picture of an Activist? 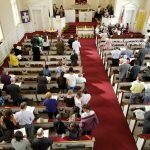 – Reflecting on protests in Ferguson and the work of Howard Thurman, Gregory Ellison of the Candler School of Theology probes questions about identity, vocation, and how Christians can fight for freedom in authentic ways. We will continue to engage with lectionary texts for the rest of the season of Epiphany. Come even if you didn’t have time to do the reading. The discussion is always lively and rich! For more information, contact Kate Gillooly at kate@heightscc.org. Come bring your questions, your curiosity, and pull up a chair. The format is simple: beer, conversation, and God. Come bring your questions, your curiosity, and pull up a chair. 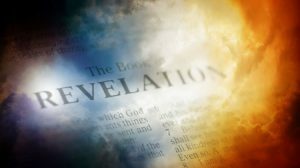 Be ready to engage with people of varying religious traditions, philosophical perspectives and life experiences. You’ll be able to share your own wrestlings and thoughts while learning something new along the way, and hey— there’s likely to be a good craft beer you haven’t tried yet! This group meets at 7:00 pm on the 3rd Tuesday of the month at Larchmere Tavern just north of Shaker Square. Hope to see you there. Shaker Heights Arts Council is currently editing a documentary focused on the 1965 Shaker visit of Martin Luther King, Jr. This film, based on excerpts from a one-act play The Meeting and interviews of eye witnesses to Dr. King’s Shaker visit, will be used as part of the Shaker Schools’ curriculum for Black History month. A fictional conversation between Malcolm X and Dr. Martin Luther King, Jr. Starring Peter Lawson Jones as Malcolm X and Greg White as Martin Luther King,Jr. 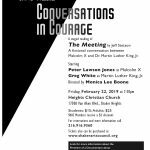 GO TO https://www.shakerartscouncil.org/conversations-in-courage.html to purchase tickets. New Initiatives Planning Retreat rescheduled! Due to the extreme weather on January 20th that caused us to cancel worship, we’ve moved the Planning Retreat to February 24th. This is a follow up to the work done at the November Leadership Retreat and will take place from 11:30-2:30. 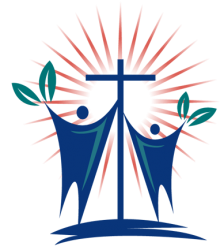 Newer members and friends of HCC are especially invited to attend and to help discern and lead our next steps for deeper engagement with the wider community. We are imagining new possibilities for HCC in the neighborhood and are eager to hear your ideas! Please let us know whether you can attend by contacting Kese Webb in the church office by Wednesday February 20th. Lunch will be provided and child care can be arranged if necessary. The planning team is Val McMillan, Cindy Maxey, Kate Gillooly and Rev. Roger Osgood. Please feel free to speak with any of us regarding your questions or suggestions. Peace and Justice (P&J) – On Sunday, January 13th in celebration of Martin Luther King’s birthday, sheets were placed in the Campbell Room for those who wished to sign up to provide a community service. Many of you signed up to participate in the following services; some of which will extend through to February 3rd. 1) Baking brownies and/or serving lunch at the Men’s Shelter, 2) Volunteering for an event with seniors at Campbell Court, 3) Volunteering to shovel snow and/or run errands for the elderly, 4) Making Valentine cards with your child/children to give to those who receive Meals on Wheels, 5) Assisting in packaging the personal hygiene items that you donated in gallon bags for the homeless, 6) baking cornbread muffins, donating chili, and/or serving a Community Meal at Disciples Christian Church.Thank you for all that you do. CWF – The search continues for persons to help at our Thrift Shop. In the past nearly eighteen months, the shop has seen increasing profits. These are shared in many ways including with those in the community who are in need. The present director, Nancy Newman, has done an excellent job with advertising and attracting quality donations. If you haven’t been there recently, give it a try or ask a church member who often make purchases from the Thrift Shop. 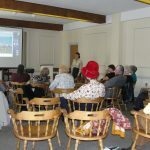 Outreach – The Committee has recently approved community applications that meet the criteria for funding. For more information about the criteria, go to the Heights Christian Church website. 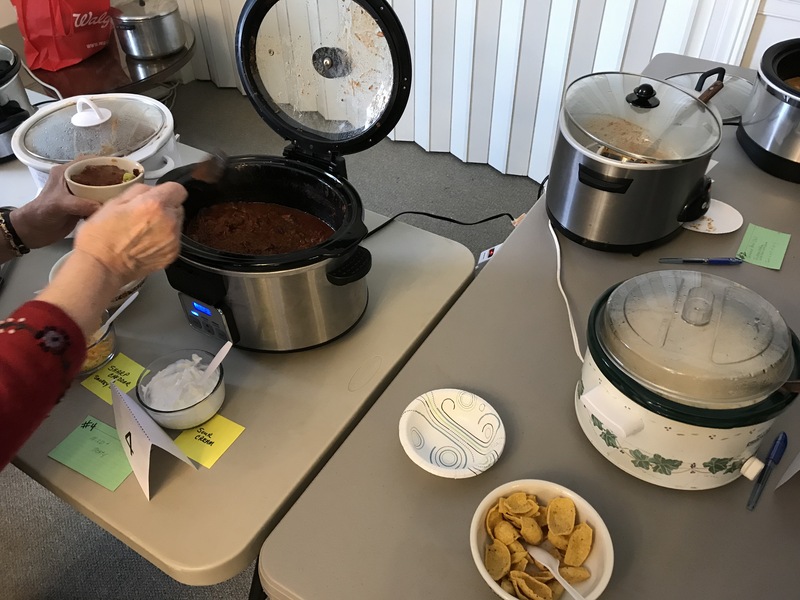 Community Meal – There are many churches and community groups who provide monthly community meals. 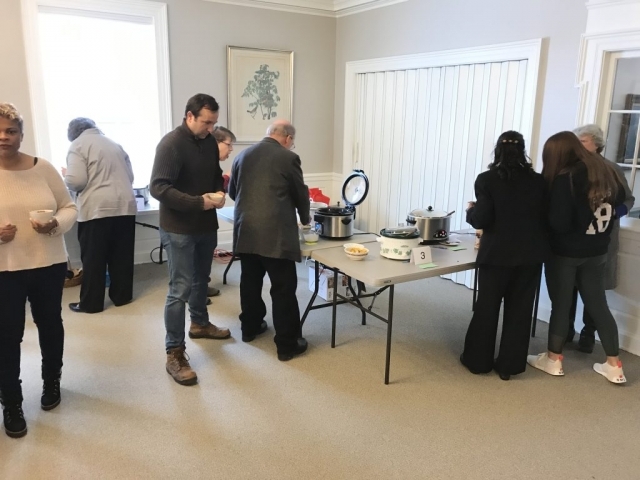 A small group of HCC members and other community persons are reaching out to host a community meal that is a little different on February 16th, noon to 2pm. 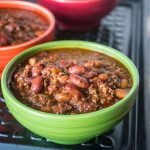 It will not be about only serving others but rather including everyone in the meal process. The launching of this idea sprang from the spirit of “building community”. The group recognizes that sometimes food is not the only thing needed/desired but rather fellowship as well–someone to talk to. 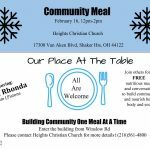 These meals will focus on everyone participating in preparation of the meal; eating and fellowship together; and cleaning up together. A local chef may be involved providing guidance in kitchen operations. The theme is: “Our Place at the Table”. Although HCC will be the location for this event, the expectation/goal is that other groups and individuals will partner with us in the future. More information will follow in our Sunday bulletin. Green Chalice – Look for periodic information in the Sunday bulletin with suggestions for improving our environment. The Thrift Shop holiday pop-up shop was a huge success, providing a means to recycle holiday decorations and raising more than $2000.00 for the CWF! Thanks to everyone who helped set up, sell merchandise, and take down the shop. Volunteers contributed their designing, selling and packing expertise in addition to giving many hours of their time. Everyone deserves thanks for their help in this effort. And, of course, thanks to everyone who donated to and shopped at the Shop! Now that the holiday decorations are gone, the pop-up room is being used for children’s clothes, games, toys, puzzles and linens. This area is also being used to display lamps—we’ve got lots of good ones—luggage and furniture. So since we’re selling them, we’re also accepting lamps, luggage and furniture as donations. As usual, these need to be in safe and working condition and clean. Pick-up and delivery services are not provided, and couches or similar large pieces cannot be accepted. But we’ve had great success selling tables and chairs, and are optimistic that this will continue with the new, expanded selling area. The Thrift Shop is currently open three days but with slightly reduced hours on Friday and Saturday—Thursday from 10 AM to 1 PM and Friday and Saturday from 10 AM to 4 PM. However, beginning in March the shop will no longer be open on Thursdays because of a lack of volunteers. If you have a few hours to help put out and organize merchandise and to assist customers, please consider helping out with this worthwhile and fun mission. And many thanks to all the volunteers who continue to keep the shop running. Remember, donations are always accepted, including clothing, jewelry, shoes, household goods, books, puzzles, games, lamps and furniture. There’s a demand for Pyrex right now so if you have any that you no longer need, the Thrift Shop will be delighted to take it! Clothing must be clean and in good condition—no fraying, tears, or stains. We cannot sell socks or underwear, so consider donating those elsewhere. Household goods must also be in good condition and clean. We’ve received some wonderful donations recently and they have just flown off the shelves so take a look and see if you find something or several things or lots of things to contribute! Remember—all sales go to further the missions of the CWF and Heights Christian Church. Merchandise is always changing, and winter clothing and purses are currently on sale. You’ll be delighted at what you find, and are sure to find a treasure to take home. Are you looking for a new resource to inspire and guide your daily devotions? Are you in need of a support to help you move forward in your spiritual growth and development? Do you long for something to encourage you to read, study, meditate and pray each day? The Renewal Works Team has such a resource to recommend to you. It is a collection of the writings of noted theologian Henri J. M. Nouwen edited and fashioned into a series of short, pithy, and inspiring daily devotions. Nouwen was a Dutch-born Catholic priest, professor, and pastor, who gained international renown as the author of over thirty books on the spiritual life. Nouwen’s books have been translated into more than thirty languages and have sold upward of seven million copies world-wide, resonating with people across the religious, spiritual, cultural and political spectrum. He offers beautiful, challenging and life-changing insights on the spiritual life. Our Elders will be using this as a resource for opening study and reflection at each of their upcoming meetings, starting in February. There will be a copy purchased for church use which can be borrowed by anyone from our library. It is also available from the Shaker Heights Public Library. This book is readily available from Amazon.com. The cost is $12.99 for a Kindle download, $16.22 for paperback and $23.40 for hard cover. We urge you to consider obtaining and using this wonderful book. Let these daily readings guide you into a deeper awareness of your identity as a beloved child of God! 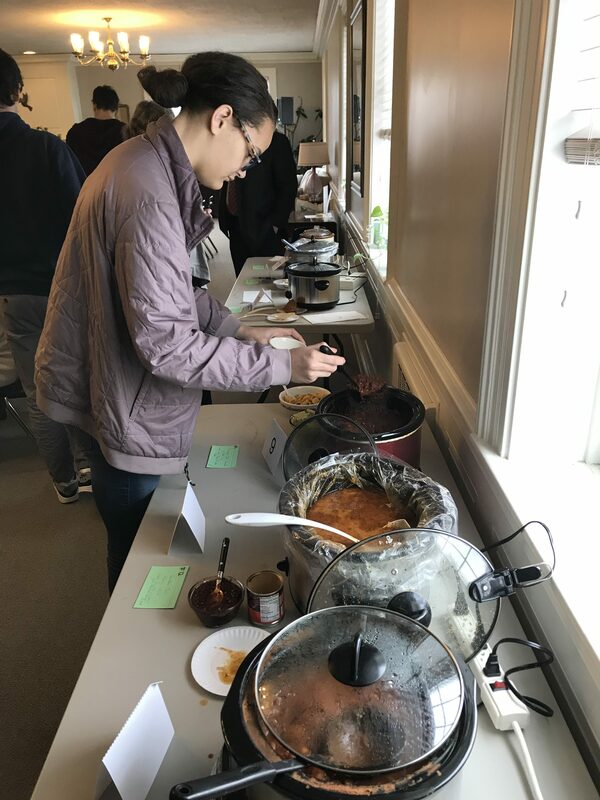 Many thanks to our cooks and judges and everyone who helped make the Chili Cook Off a great, fun event. Our First Place winner was Andrena Jones-Sharp. Congratulations to all the other winners and to everyone who participated! Pastor Roger, Ying, Kate, Rev. 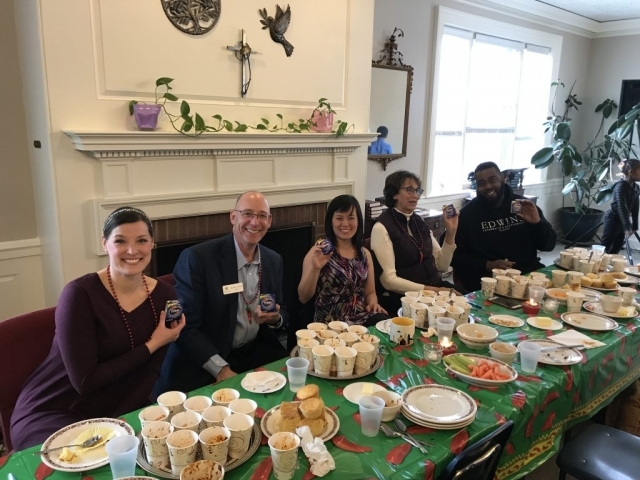 Michele, Bryce, Rosie and Kese, want to express their gratitude for the kind and generous expressions of affection and appreciation from the congregation. Thanks for an assortment of greeting and gifts from the congregation and Elders. 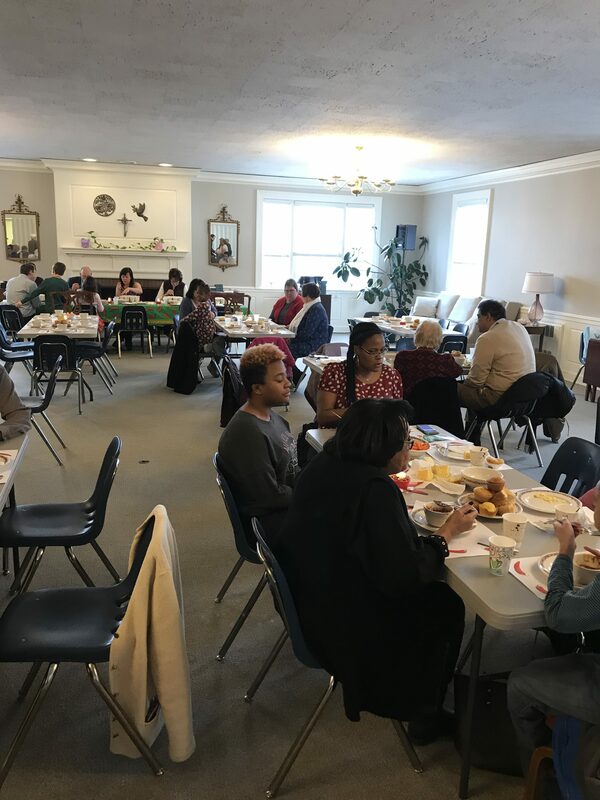 It is a pleasure to have the opportunity to serve the members of Heights Christian Church.